The preparations for my birthday turned out to be just as chaotic and stressful as everything else I ever plan suddenly seems to become – the illness set me back by two days and the carefully calculated schedule was a mess. I got to go shopping for all the necessities (food and wine) Thursday night and stayed up until very late o’clock, trying to get everything ready for Friday. Luckily my girls came to my rescue early in the afternoon, helped me clean, cook and take care of the baby. H took himself and the baby to grandma’s house so we got to prepare and party on our very own like the big girls we are now, hihi. When everyone had arrived (and after the make-up artist had been here to do my make-up) I took out the curlers I decided to use to save time (so I didn’t have to interrupt my party preparations to use a curling iron) and discovered that they had turned my hair into a pretty disgusting looking afro. That, together with the fact that the dress I ordered looked nothing like I had imagined, put me down quite a bit. The problem was solved by borrowing auntie G’s little black dress (thanks for saving the day, sugar! 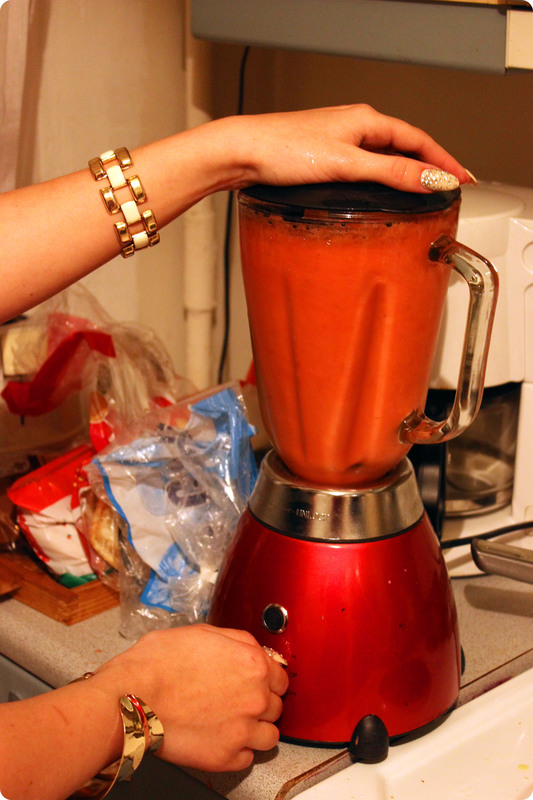 ), creating a nice little messy updo and making a large batch of strawberry Margaritas. We got the party started, put on the playlist we had put together early on and everyone started getting to know each other. All my girls clicked almost instantly and we had so much fun when everyone was introducing themselves by saying their name and then telling the story of how they met me. Noone was really able to stick to the topic because me and my girls have a l o t of “war stories” to tell. Then I dealt out the goodiebags, we ate, drank wine, discussed all kinds of existential matters and childhood stories to then move on to the trivia I had planned – I picked out three team captains who then got to put together their teams. Everyone got colorful party horns, pen and paper for the team and the competition was on. I asked them a question about myself and whoever lost the round (by answering incorrectly or too slowly) got to carry out their punishment. Some had to call a friend and ask them to help pick out a good secret agent name, some got to read their texts out loud and some drew cats on each others’ shoulders. We had soooooooooo much fun and for some reason the time really flew by fast as hell and before we knew it, it was already 3 a.m. and if we wanted to go dancing, we’d have to move quick. We ordered a large taxi cab and went out. I didn’t stay out too long because there was really nothing there and I was exhausted, but I can at least say I was there! When I got home I opened all the presents (I asked my guests to fit my pressies into envelopes so I could arrange the best party ever), got all weepy and happy and then went to bed. When I got up in the morning I had a very special and exclusive after party coming my way – cleaning it all up. God was it worth it! 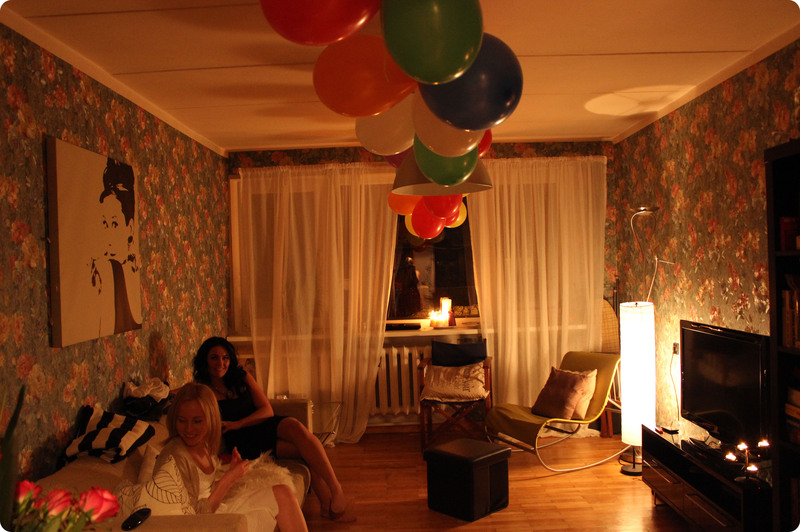 We created a nice, romantic ambience with loads and loads of candles. Looks cozy, doesn’t it? “Congratulations on my birthday” – There can’t be a glamorous party without goodiebags! Put my afro up in a messy knot and I think it looked pretty okay! Triinu looking pretty serious and badass, but I promise she really did have fun! Team Blue feeling the pressure of the competition – they didn’t win, but they sure put up a good fight! Kristel’s friend thought that a good secret agent name for her would be “Alarm”, that’s how subtle he thinks she is! Team Kristjaana (Kristel+Janika) being punished a g a i n for being slow as hell. Here: dialling a number to call people in the middle of the night and make complete asses of themselves. Guess how hard we laughed? Party was AWESOME! Lets do it again next friday night! te kõik näete suurepärased välja. väga kaunid naised!